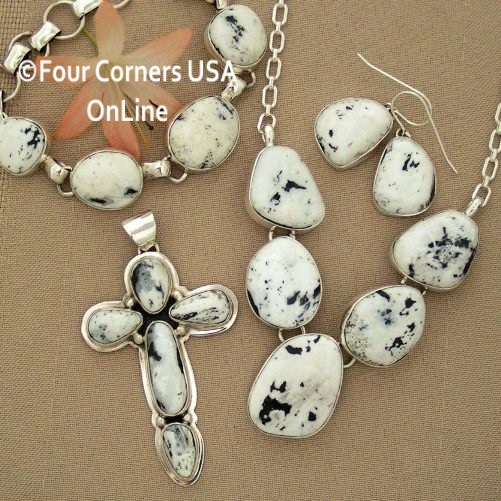 Beautiful Black and White Buffalo Stone (White Turquoise) Pendants and Necklaces suitable for Men and Women including one of a kind Earring Necklace Jewelry Sets. Sacred White Buffalo Turquoise Pendants and Bead Necklaces in striking Black and White. Our unique Collection of fine Native American Artisan White Buffalo Stone Jewelry is always evolving with new pieces being added as they are created! 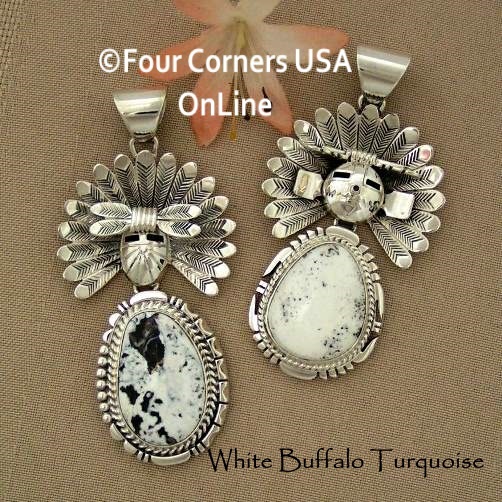 Beautiful eclectic Collection of Sacred White Buffalo Turquoise Pendants, exquisite White Turquoise Jewelry Sets, Necklaces including Pendants with Chains and White Buffalo Turquoise Pendants with Bead Necklaces. Our featured Native American Silversmiths include one of a kind creations from Navajo Artisans Freddy Charley, Lyle Piaso, Tony Garcia, Lester Jackson, Larson Lee, Kathy Yazzie and Arkge Nelson. Newest additions of White Buffalo Turquoise Stone Necklaces by Native American Navajo Silver Jeweler Phillip Sanchez. A seasoned silversmith Mr. Sanchez always brings to the table an assortment of style but those who know realize this is his signature workmanship. The stone is set in clean straight bezel set on high polish silver with intricate asymmetrical ethnic cutouts. Some of these wonderful Necklaces offer a collaboration with another seasoned Navajo Silversmith Kathy Yazzie and a wonderful compliment to the Necklace with their more petite size and asymmetrical shape. White Buffalo Turquoise Necklace and Earring Jewelry Sets in a modern design. Navajo Artisan Lyle Piaso is one of our newest silversmiths for White Buffalo Turquoise Jewelry and has created spectacular, showy pieces including Rings, Pendants and Jewelry Sets. Lyle Piaso, son of Joe Piaso Jr, is offering clean contemporary lines similar to our beautiful jewelry pieces by Tony Garcia. Mr. Piaso is adorning these large beautiful White Turquoise Stones in straight bezel settings so all eyes are on the stones.